Why serve your soup in a plain pot when you can serve it in this beautiful soup tureen? Because of the high-quality clay used to make Polish Stoneware from Boleslawiec, the tureen will keep your favorite soup or stew warm for a long time and the glaze which covers it makes it extraordinarily easy to wash! Each piece of Polish Stoneware is handmade and hand-painted. 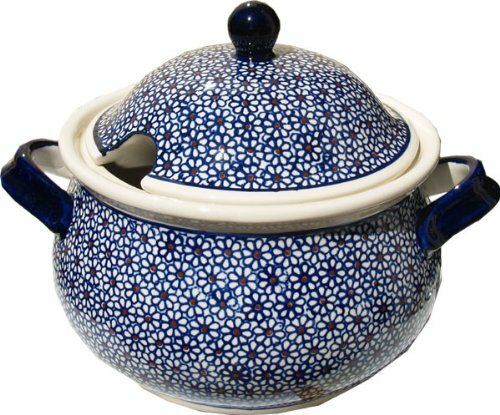 Use&Care: Polish Pottery is oven- dishwasher- stove- and microwave oven safe, lead and cadmium free, resistant to chip. If you have any questions about this product by Polish Pottery Market, contact us by completing and submitting the form below. If you are looking for a specif part number, please include it with your message.